The opening session about mission-driven innovation was led by Provost Julian Schuster and President Beth Stroble, who joined from Leiden via Webster's global WAN. The 2016 cohort of the Global Leadership Academy met as a group in person for the first time Monday, kicking off a week of sessions for leadership development at the home campus in St. Louis. 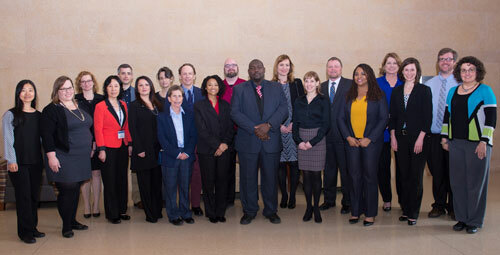 This is the fifth cohort of GLA, which is comprised of faculty and staff who are selected for a yearlong program that helps them lead in their roles and positions within the University. Throughout the year they engage with University administrators, deans and faculty members as well as third-party experts in leadership development -- all as part of a purposeful learning experience that includes a community of learning, field experiences, mentoring and applied experiences. On the opening day the fellows heard from the president and provost, from GLA directors Laura Rein, Erik Palmore and Holly Hubenschmidt, as well as GLA alumni Mary Preuss and John Buck. 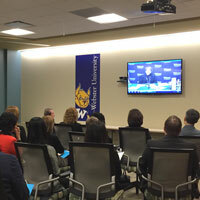 The opening session was about mission-driven innovation, led by Julian Schuster, Webster's provost, senior vice president and chief operating officer, and President Beth Stroble, who spoke from Leiden via the University's global WAN. Preuss, associate professor in Biological Sciences, was joined by Palmore for the sessions, "Leading From Where You are for Meaningful Change" and "Leading and Learning in a Network." 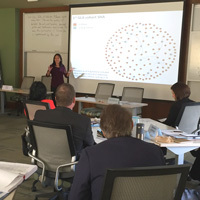 She presented continuing research into the network connections among participants of GLA. Buck, associate dean of students and director of Housing and Residential Life, led "Leading and Managing: Learned through Experience; Rooted in Context." On Tuesday the fellows will take the opportunity of meeting on the Webster Groves campus, where the University was founded in 1915, to conduct office visits and data gathering to better understand the workings of the Webster network. Wednesday's schedule includes a morning of diversity and inclusion topics with Nicole Roach, associate vice president of Diversity and Inclusion, and Betsy Schmutz, associate vice president and chief human resources officer. On Wednesday afternoon they will explore their own individual strengths and talents inventory and discuss the implications for team success. See the list of 2016 fellows here.